If basketball tryouts have not already started for your athlete, they will be starting within the week. Hopefully, your athlete did enough to get prepared for tryouts so he/she can make the team. What would one need to do to make sure they were super prepared? Some kids go into it thinking that they were prepared, but in reality it only scratched the surface. What I did is create a tryout prep checklist for your athletes so that they can get a sense of what is needed to come into the tryouts in the best shape possible. I probably should have put this together in early September, but to be honest I didn’t think of this topic until this past Saturday morning. Of course, I ask people all the time to put in the comments or reply to my emails what they want me to talk about and they never do. So I’ll blame you guys. Now, understand I am not a basketball coach, but I did play basketball in my athletic career so have a good idea what you need to do to improve your game beyond my normal realm of expertise in speed/strength. The first thing you need to do before you start putting your body through all the rigors of training is ASSESS how last season went. What went right and what went wrong? Did the coach give you some things you need to work on in the offseason and have you worked on them? Once you assess what you need to do then you could slant your training to address those issues. Jumping Ability – Let’s start with this right out the gate. Basketball is a lot of jumping and you need to try and improve your vertical as best you can. Plyometrics need to be worked in and it can be as simple as trying to touch the net, backboard, or rim. If those are easy, then try with two hands or hold the basketball and get up as high as you can touching those same spots. Then try to do those off one leg, for both legs. You want to be diverse with both types of leaping ability. SAQ (Speed, Agility, Quickness) – You need to continue to develop your speed and quickness. It can help you get down the court faster than your opponents. It will also help on defense to stay in front of your defenders. You can do a simple push-up drill to help with acceleration (lie on the ground and upon a command, hop up and sprint a desired distance). You can also use the lane and shuffle back and forth as quickly as you can and see how many you get. You can either hold something to add weight to improve your speed or just try to push and get a higher number of reps. 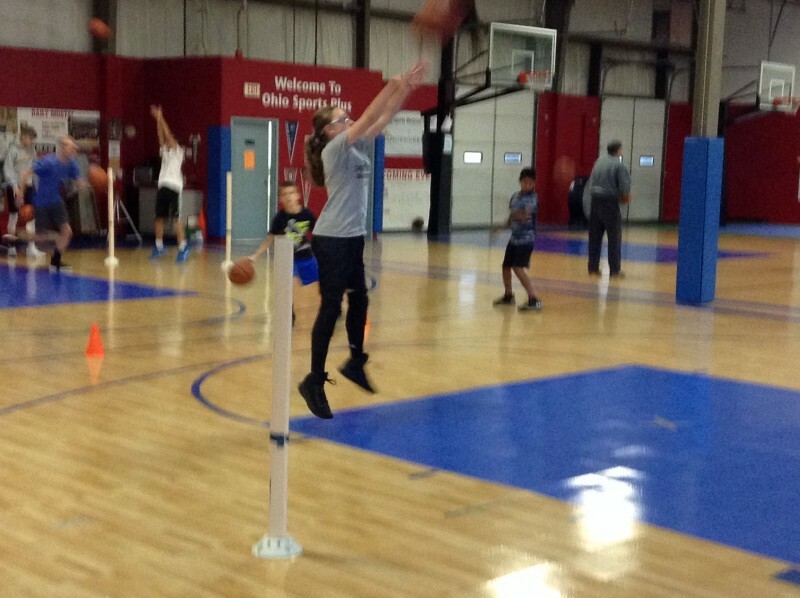 Strength – If you are a middle school basketball player or older, improving strength is going to be important and it alone might positively affect the speed/quickness and jumping. Just focus on a total body program. For the younger kids, it can simply be technique focused and bodyweight exercises. For the older kids, they can do basic exercises for the body parts, but make sure they have a good coach to teach them the lifts. Conditioning – You do NOT want to report out of shape. I encourage playing a lot of pickup, but don’t rely on that to get you in shape. I know you won’t be going all out during those games. Getting in shape would be as simple as running suicides on the court for a certain amount of time. Or run around the court sprinting the length and jogging the width, once again for a certain amount of time. Play Lots of Pickup Ball – If you feel your skill is fairly good, then I can’t emphasize this enough to play pickup ball. No organized scrimmages. No coaches putting stipulations on it. Just roll the ball out, pick teams, and play. Work On The Skill – If your skill isn’t good, then find a hoop and take lots of shots. Dribble tons. The ball should be an extension of your hand. If you can’t dribble proficiently, it doesn’t matter how good of a shot you are you can’t be trusted on the court. What do you think? Leave a comment in the box below of things I might have missed or what you liked or did not like about this checklist.